Quasars Are Similar To Active Galaxies In The Universe. Quasars (contraction of QUASi-stellAR radio source) is an astronomical source of electromagnetic energy, including light, which shows a very high redshift. The scientific consensus is that this high redshift is the result of Hubble's law. This implies that quasars are very distant. To be observable at that distance, the energy output of quasars must dwarf that of almost every known astrophysical phenomenon with the exception of comparatively short-lived supernovae and gamma-ray bursts. They may readily release energy in levels equal to the output of hundreds of average galaxies combined. Artist's impression of quasar GB1508. In optical telescopes, most quasars look like single points of light (i.e. point source) although some are seen to be the centers of active galaxies. Some quasars display rapid changes in luminosity, which implies that they are small (an object cannot change faster than the time it takes light to travel from one end to the other; but see quasar J1819+3845 for another explanation). The highest redshift currently known for a quasar is 6.4. Quasars are believed to be powered by accretion of material onto supermassive black holes in the nuclei of distant galaxies, making these luminous versions of the general class of objects known as active galaxies. No other currently known mechanism appears able to explain the vast energy output and rapid variability. Knowledge of quasars is advancing rapidly. As recently as the 1990's there was no clear consensus as to their origin. More than 100,000 quasars are known. All observed spectra have shown considerable redshifts, ranging from 0.06 to the recent maximum of 6.4. Therefore, all known quasars lie at great distances from us, the closest being 240 Mpc (780 million ly) away and the farthest being 4 Gpc (13 billion ly) away. Most quasars are known to lie above 1.0 Gpc in distance; since light takes such a long time to cover these great distances, we are seeing quasars as they existed long ago - the universe as it was in the distant past. Although faint when seen optically, their high Redshift implies that these objects lie at a great distance from us, making quasars the brightest objects in the known universe. The quasar which appears brightest in our sky is the ultraluminous 3C 273 in the constellation of Virgo. It has an average apparent magnitude of 12.8 (bright enough to be seen through a small telescope), but it has an Absolute magnitude of -26.7. So from a distance of 10 parsecs (about 33 light-years), this object would shine in the sky about as bright as our Sun. This quasar's luminosity is, therefore, about 2 trillion (2 × 1012) times that of our sun, or about 100 times that of the total light of average giant galaxies like our Milky Way. The hyperluminous quasar APM 08279+5255 was, when discovered in 1998, given an Absolute magnitude of -32.2, although high resolution imaging with the Hubble Space Telescope and the 10 m Keck Telescope reveal that this system is gravitationally lensed. A study of the gravitational lensing in this system suggests that it has been magnified by a factor of ~10. It is still substantially more luminous than nearby quasars such as 3C 273. HS 1946+7658 was thought to have an absolute magnitude of -30.3, but this too was magnified by the gravitational lensing effect. Quasars are found to vary in luminosity on a variety of time scales. Some vary in brightness every few months, weeks, days, or hours. This evidence has allowed scientists to theorize that quasars generate and emit their energy from a very small region, since each part of the quasar would have to be in contact with other parts on such a time scale to coordinate the luminosity variations. As such, a quasar varying on the time scale of a few weeks cannot be larger than a few light-weeks across. Quasars exhibit many of the same properties as active galaxies: radiation is nonthermal and some are observed to have jets and lobes like those of radio galaxies. Quasars can be observed in many parts of the electromagnetic spectrum including radio, infrared, optical, ultraviolet, X-ray and even gamma rays. Most quasars are brightest in their rest-frame near-ultraviolet (near the 1216 angstrom (121.6 nm) Lyman-alpha emission line of hydrogen), but due to the tremendous redshifts of these sources, that peak luminosity has been observed as far to the red as 9000 angstroms (900 nm or 0.9 µm), in the near infrared. 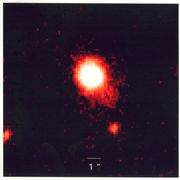 Iron Quasars show strong emission lines resulting from ionised iron, such as IRAS 18508-7815. This view, taken with infrared light, is a false-color image of a quasar-starburst tandem with the most luminous starburst ever seen in such a combination. 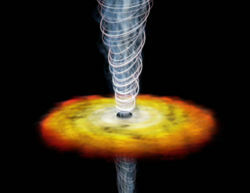 The quasar-starburst was found by a team of researchers from six institutions. Since quasars exhibit properties common to all active galaxies, many scientists have compared the emissions from quasars to those of small active galaxies due to their similarity. The best explanation for quasars is that they are powered by Supermassive black holes. To create a luminosity of 1040 W (the typical brightness of a quasar), a super-massive black hole would have to consume the material equivalent of 10 stars per year. The brightest known quasars are thought to devour 1000 solar masses of material every year. Quasars are thought to 'turn on' and off depending on their surroundings. One implication is that a quasar would not, for example, continue to feed at that rate for 10 billion years, which nicely explains why there are no nearby quasars. In this framework, after a quasar finishes eating up gas and dust, it becomes an ordinary galaxy. Quasars also provide some clues as to the end of the Big Bang's reionization. The oldest quasars (z > 4) display a Gunn-Peterson trough and clearly have absorption regions in front of them indicating that the Intergalactic medium at that time was neutral gas. More recent quasars show no absorption region but rather their spectra contain a spiky area known as the Lyman-alpha forest. This indicates that the intergalactic medium has undergone reionization into plasma, and that neutral gas exists only in small clouds. One other interesting characteristic of quasars is that they show evidence of elements heavier than helium. This is taken to mean that galaxies underwent a massive phase of star formation creating Population III stars between the time of the Big Bang and the first observed quasars. If no evidence for such stars is found and alternative mechanisms for producing heavy elements cannot be found, this may seriously undermine the current views of the universe. Light from these stars may have been observed using NASA's Spitzer space telescope, although as of late 2005 this interpretation remains to be confirmed. The first quasars were discovered with radio telescopes in the late 1950s. Many were recorded as radio sources with no corresponding visible object. Hundreds of these objects were recorded by 1960 and published in the Third Cambridge Catalogue as astronomers scanned the skies for the optical counterparts. In 1960, radio source 3C 48 was finally tied to an optical object. Astronomers detected what appeared to be a faint blue star at the location of the radio source and obtained its spectrum. Containing many unknown broad emission lines, the anomalous spectrum defied interpretation-a claim by John Bolton of a large redshift was not generally accepted. In 1962 a breakthrough was achieved. Another radio source, 3C 273, was predicted to undergo five occultations by the Moon. Measurements taken by Cyril Hazard and John Bolton during one of the occultations using the Parkes Radio Telescope allowed Maarten Schmidt to optically identify the object and obtain an optical spectrum using the 200-inch Hale telescope on Mount Palomar. This spectrum revealed the same strange emission lines. Schmidt realised that these were actually spectral lines of hydrogen redshifted at the rate of 15.8 percent. This discovery showed that 3C 273 was receding at a rate of 47,000 km/s. This discovery revolutionized quasar observation and allowed other astronomers to find redshifts from the emission lines from other radio sources. 3C 48 was found to have a redshift of 37% the speed of light (as predicted by John Bolton). So far, the clumsily long name 'quasi-stellar radio sources’ is used to describe these objects. Because the nature of these objects is entirely unknown, it is hard to prepare a short, appropriate nomenclature for them so that their essential properties are obvious from their name. For convenience, the abbreviated form 'quasar’ will be used throughout this paper. Later it was found that not all (actually only 10% or so) quasars have strong radio emission (are 'radio-loud'). Hence the name 'QSO' (quasi-stellar object) is used (in addition to 'quasar') to refer to these objects, including the 'radio-loud' and the 'radio-quiet' classes. One great topic of debate during the 1960s was whether quasars were nearby objects or distant objects as implied by their Redshift. It was suggested, for example, that the redshift of quasars was not due to the Doppler effect but rather to light escaping a deep gravitational well. However a star of sufficient mass to form such a well was believed to be unstable . Quasars also show unusual spectral emission lines which were previously only seen in hot gaseous nebulae of low density, which would be too diffuse to both generate the observed power and fit within a deep gravitational well . There were also serious concerns regarding the idea of cosmologically distant quasars. One strong argument against them was that they implied energies that were far in excess of known energy conversion processes, including nuclear fusion. At this time, there were some suggestions that quasars were made of some hitherto unknown form of stable antimatter and that this might account for their brightness. This objection was removed with the proposal of the accretion disc mechanism in the 1970s, and today the cosmological distance of quasars is accepted by almost all researchers. In the 1980s, unified models were developed in which quasars were viewed as simply a class of active galaxies, and a general consensus has emerged that in many cases it is simply the viewing angle that distinguishes them from other classes, such as Blazars and radio galaxies. The huge luminosity of quasars is believed to be a result of friction caused by gas and dust falling into the accretion discs of supermassive black holes, which can convert about half of the mass of an object into energy as compared to a few percent for nuclear fusion processes. This mechanism is also believed to explain why quasars were more common in the early universe, as this energy production ends when the supermassive black hole consumes all of the gas and dust near it. This means that it is possible that most galaxies, including our own Milky Way, have gone through an active stage (appearing as a quasar or some other class of active galaxy depending on black hole mass and accretion rate) and are now quiescent because they lack a supply of matter to feed into their central black holes to generate radiation.